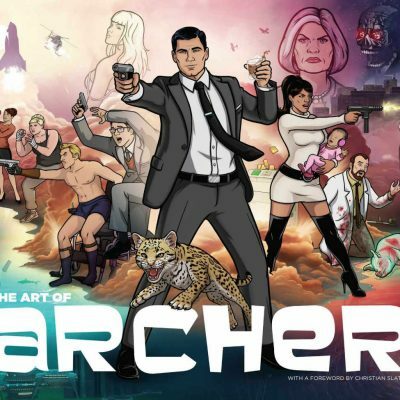 Trinity Animation has been fortunate to work on the hit FX show “Archer.” Almost every episode takes the cast to exciting locations that are a blast to construct. From the Louisiana bayou to a space station orbiting the planet, the Archer team has gone just about everywhere in pursuit of justice. Or perhaps just a decent Mai Tai. 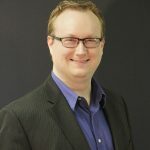 In anticipation of Archer Season 7, I posed a question to Chad Koerner, one of our animators who has done a considerable amount of work on the complex animation environments for Archer. What were the most complex animation environments to construct? I have shared his responses below. Needless to say, some plot spoilers are below, so viewer be warned! Final rendered shot of the underwater sea lab. 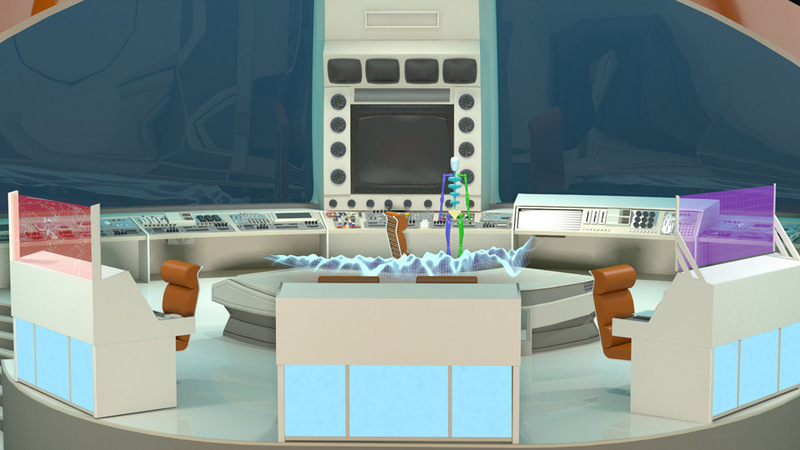 Finished sea lab used in the Archer episode, Sea Tunt: Part II. In the episode Sea Tunt: Part II, the Archer crew heads out to the middle of the ocean to stop an ecological disaster. The episode reaches its peak as they interview the clearly insane Captain Murphy on the bridge of his undersea lab. Chad pointed out that the lab was clearly inspired by the Adult Swim show Sealab 2021, and was an interesting non-realistic setting to render. 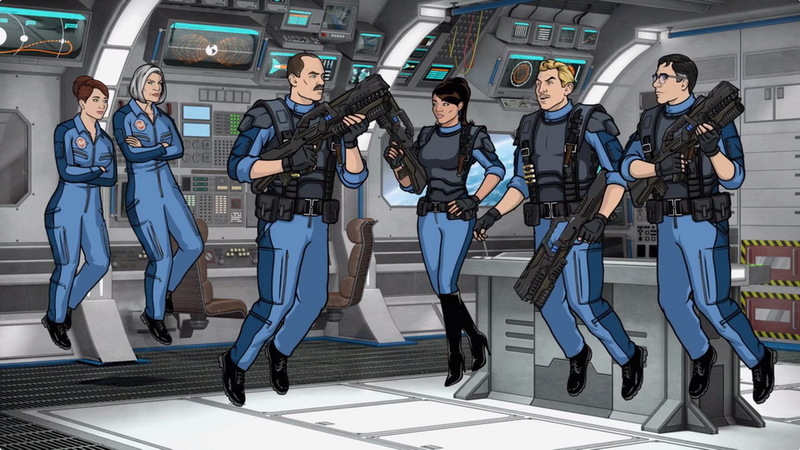 Like most of the Archer season finales, this episode didn’t take place in one of the usual environments. It took around 200 hours to build all the complex animation environments used throughout the course of the episode. 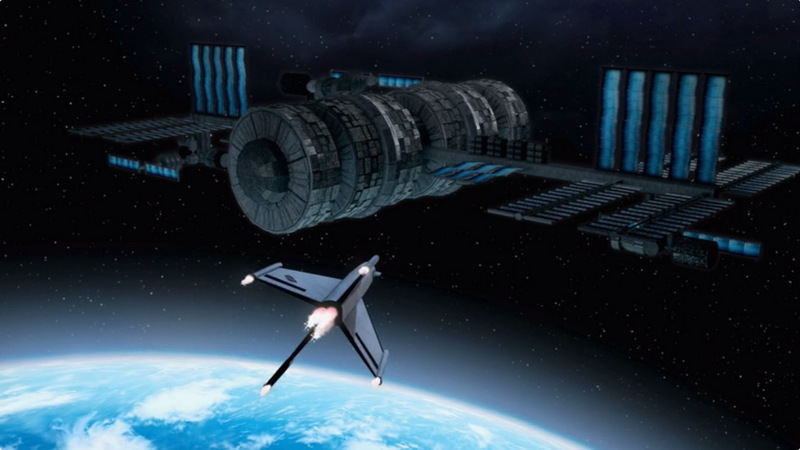 Rendered model of the orbital space station, ready to be animated. 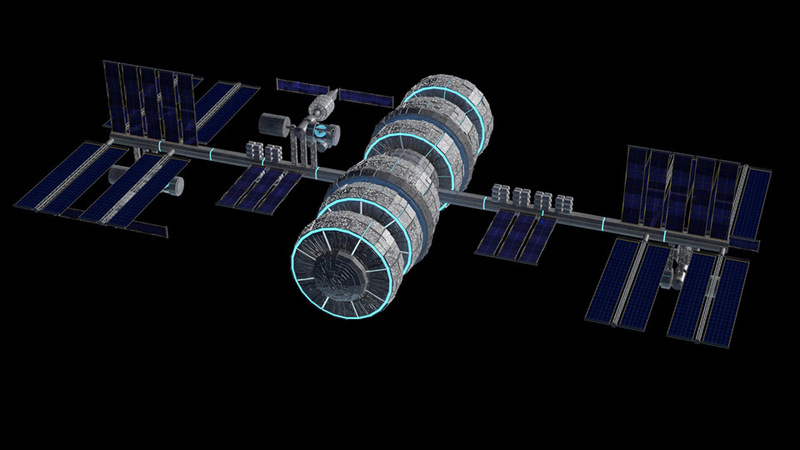 Orbital station from the finished episode, with boarding craft enroute.  The Archer team headed to outer space, to stop a mutiny that developed on the space station Horizon. It’s an action packed and hilarious finale to the third season. Chad actually referenced two set pieces from this episode, with the first being a completely unique contribution from the Trinity team. Instead of a room, rendered and static, Trinity provided a fully animated model for the Horizon. In the episode, the rings rotate, and the station comes alive, hovering above the planet. The station is built completely to scale, and ended up being about 1,300 feet long. 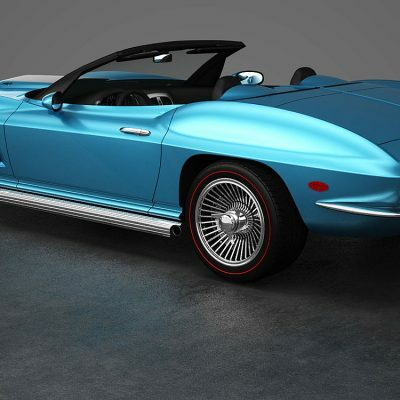 It took around 15 hours to build, texture, and light the model. Rendered model of the Tunt Manor living room, where ISIS fled after an altercation with the authorities. View of Tunt Manor from the finished episode. When ISIS is shut down due to questionable activities in the beginning of Season 5, the team has nowhere to go. That is, until Cheryl opens the doors to her family’s mansion, located in the heart of New York City. 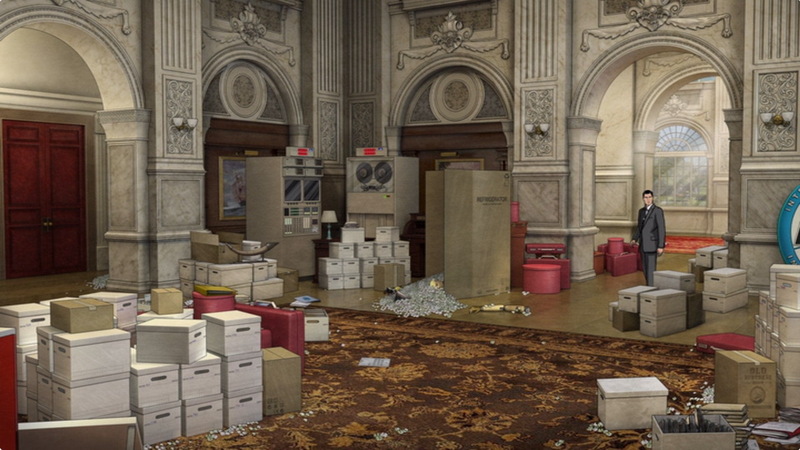 This location houses three of the most interesting and complex animation environments that Trinity constructed. The first room on our list is the audience’s first impression of the manor in season 5. The large living room housed various files and clutter that was salvaged from the ISIS offices. 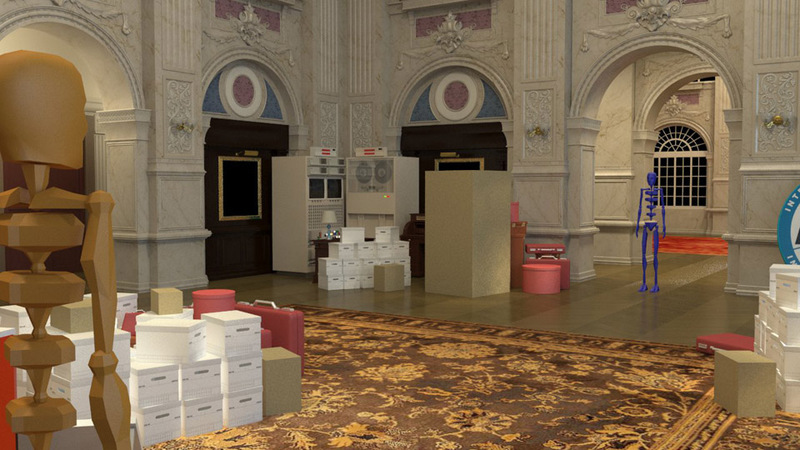 The room was used in several episodes, and on average had 30 different layers rendered. This allowed the animators at Floyd County to move the Archer cast in and around all of the objects. All told, it took about 30 hours to render the main room, entry way, hallway, and upstairs hallway. 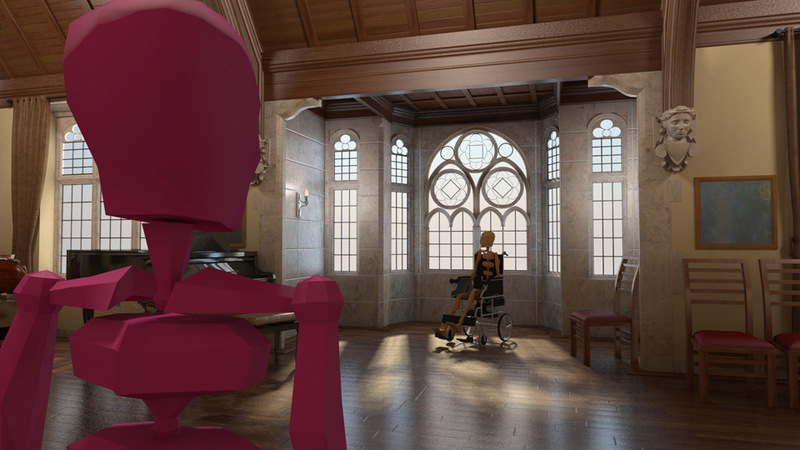 The Tunt Manor music room, fully rendered and including stand-ins for Ray and Cheryl. Finished scene used in the episode. The seventh entry on our list is by no means the largest environment created for the show, but it was one of the most striking. The music room at Tunt Manor is featured briefly in the episode, as Ray tries to coach Cheryl into becoming the country music star that she wishes to be. Chad pointed to the lighting and intricacies of the window as the reason for including this room. A lot of times, the art directors will send sketches of the scene to render, but this room was a unique case. It is almost an exact replica of a real room located in the Hart House on the St. George campus of the University of Toronto. 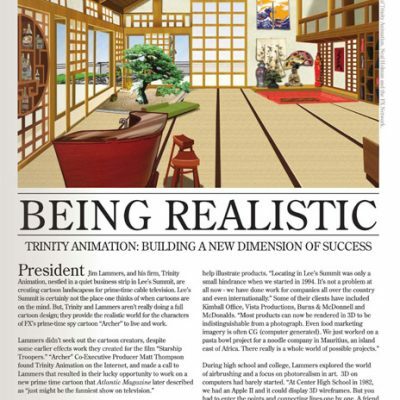 Instead of sketches, the animators at Trinity were provided photos of the actual location for reference in constructing the complex animation environments. 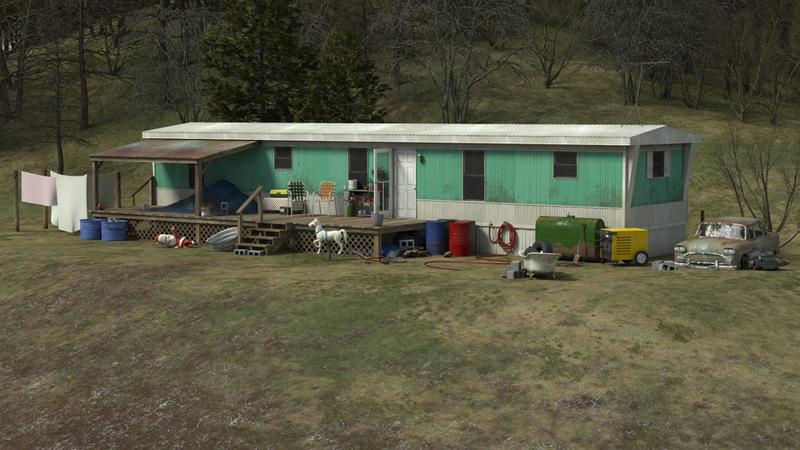 Randy Gillette’s trailer as a 3D rendering. 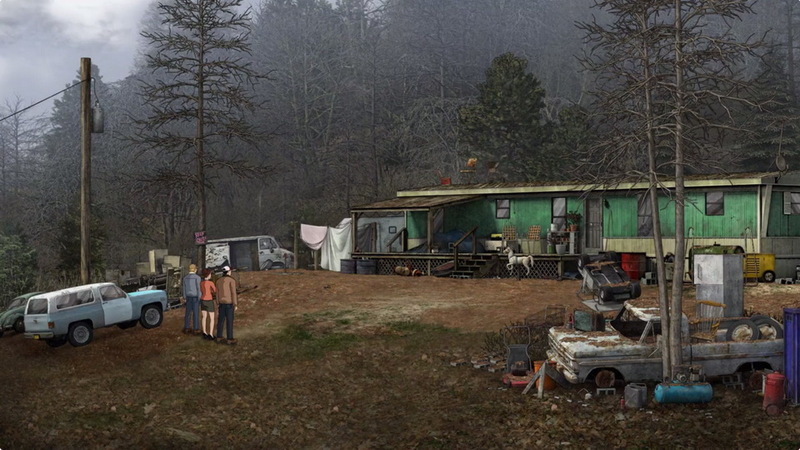 Randy’s trailer in the finished episode. The next entry is something a bit different. Most of the environments we create for Archer are clean and impressive, the kind of architecture that evokes awe. For this episode however, we were to create a run down mobile home to flesh out Ray Gillette’s backstory. The animators had a great time digging through our stock models to populate the scene appropriately. In addition, a generous amount of grime was added to lend an air of authenticity. A lot of times when Trinity creates both an interior and exterior of the same environment, all of the details (doors, windows, general scale, etc.) don’t have to match. For this scene, Floyd County wanted it to match 100%. Rendered interior of the space shuttle Intrepid. Finished interior of the Intrepid. This is the second entry on this list from the two-part finale of season 3. Creating the interior of the space shuttle Intrepid was a fun challenge, that required the team to think in terms of sleek and modern. The animators took their inspiration from science fiction movies and television, rather than existing architecture. 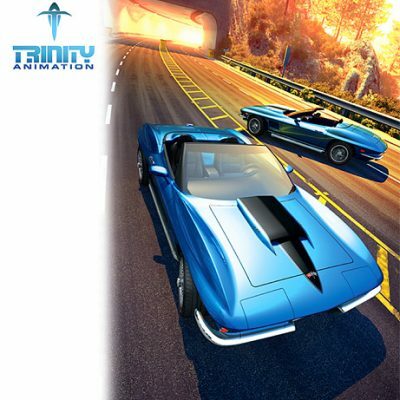 In both the Intrepid and the Horizon, Trinity created several complex animation environments in full 360 degree that were viewed from multiple angles. For a typical set, the only geometry built is what the viewer will see in the finished episode. 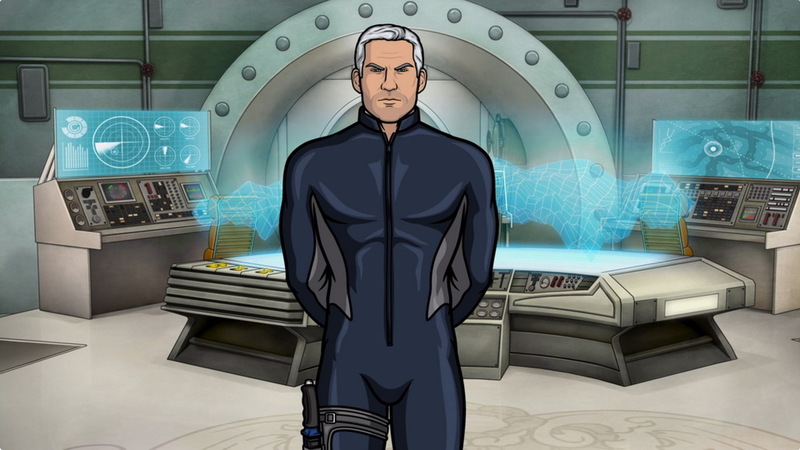 While Trinity was able to reuse a lot of props and materials, it still took around 150 hours to build the complex animation environments for Archer. The episode also featured a power loader, inspired by Aliens. The model was fully rigged for animation, and each individual piece was functional. 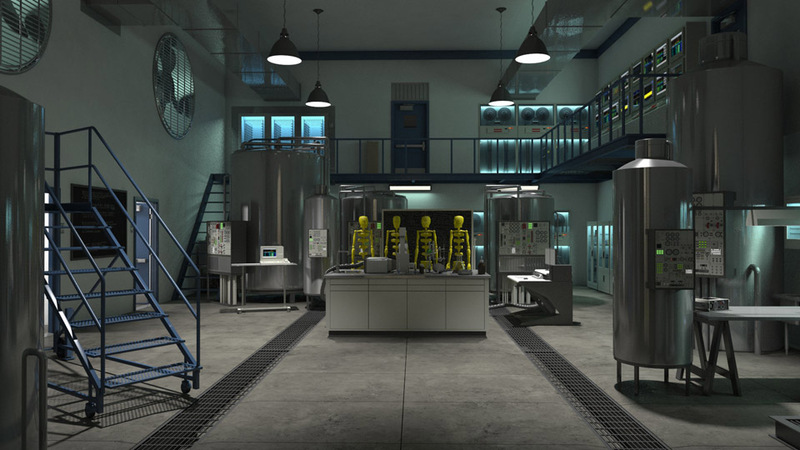 Rendering of the secret lab stocked with Krieger clones. Finished lab shot, used in the episode. When the Archer team visited San Marcos, Krieger made a shocking discovery. When exploring behind a door labeled “RESTRICTED AREA”, an entire lab was discovered, staffed by more Kriegers! The discovery of a room full of clones caused no end of concern for the normally unflappable scientist. 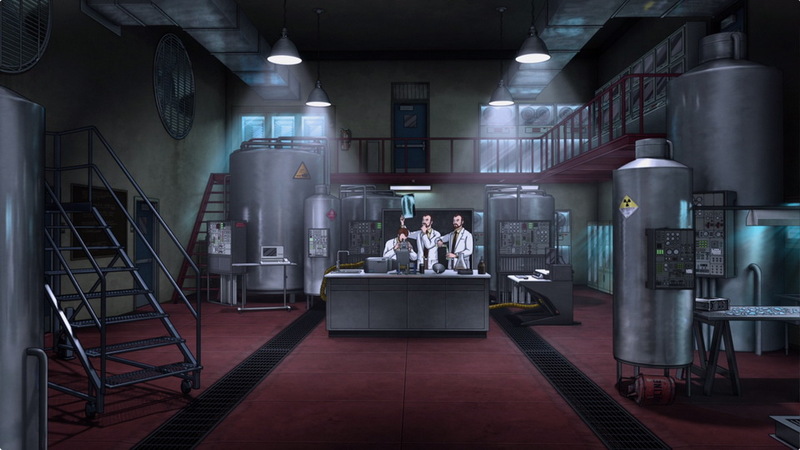 Chad says that the team had a lot of fun creating the lab area animation environments. Inspired by the clandestine lab in Breaking Bad season 3, it is difficult to determine what the clones are actually doing. They’re probably not cooking drugs. Unless they are. Rendering of the run room at Tunt Manor. Finished gun room, featured in the aired episode. Making what was probably the wisest choice she has ever made, Cheryl neglected to mention to the Archer team that her family manor had a gigantic gun room. 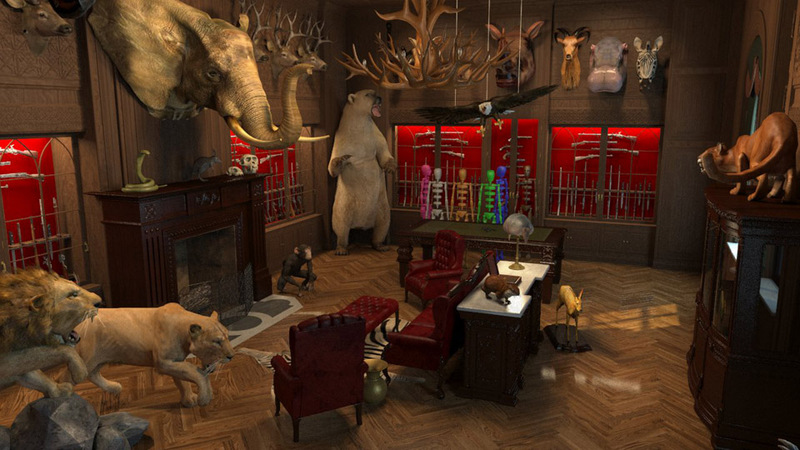 With walls adorned with the trophies of hunts long past, the room oozes a sort of old world charm. Of all of the different locations in the manor, the gun room really drives home the kind of lineage that Cheryl comes from. Chad pointed out that this scene, more than most animation environments, is just packed with props that don’t see a lot of use in Trinity’s normal animations. 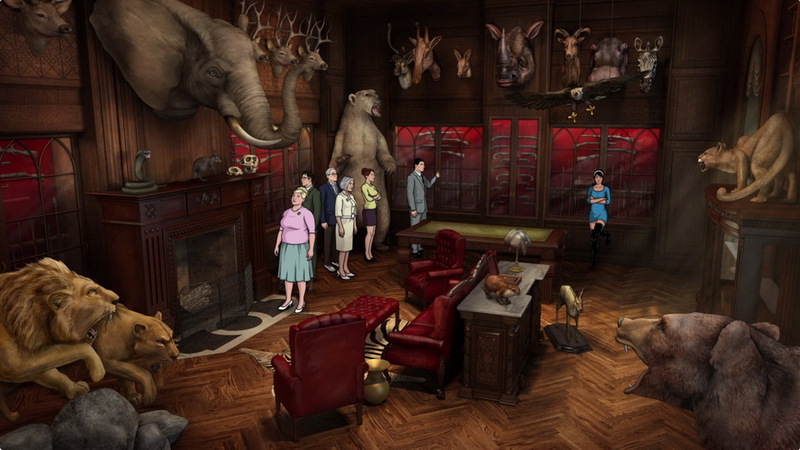 From exotic animals to classic firearms, the room is decorated in a style that is not often replicated in this day and age. Each prop in the room was rendered on a separate layer so that the cast could interact with them. For the final delivered scene (which took about 15 hours), there were over 60 layers. To adjust the poses of some of the animals, they had to be rigged for animation. Sadly, there wasn’t an outtake where the polar bear starts petting Pam’s head. Rendering of the palace’s exterior. Final shot of the palace exterior, populated by the San Marcos armed forces. 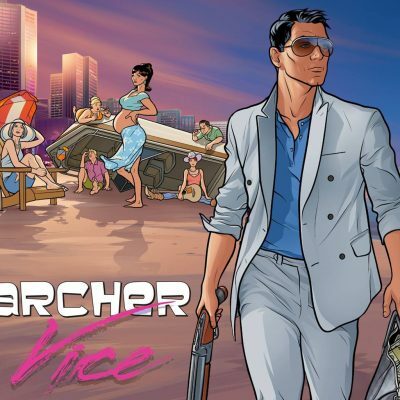 The final four episodes of Archer Vice take place in the nation of San Marcos, where the President (Gustavo Calderon) is attempting to buy a large number of weapons from the CIA in exchange for his country’s supply of cocaine. 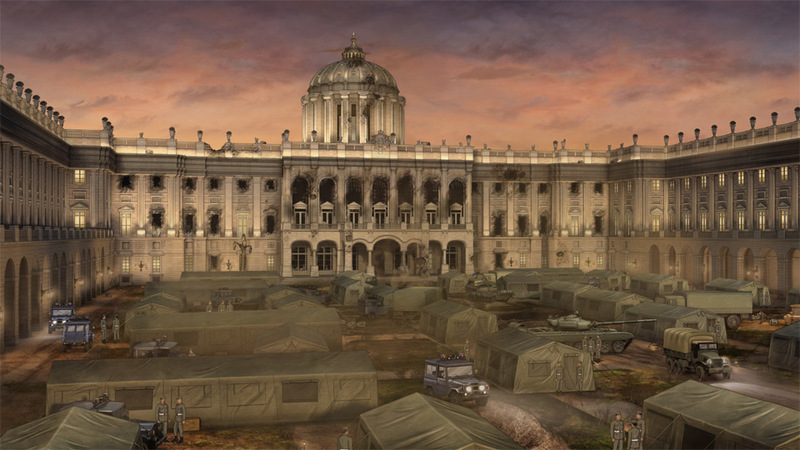 The action primarily takes place at the presidential palace, both interior and exterior animation environments, which were fully rendered by Trinity. Chad referenced the amount of detail present in the completed model. To accommodate the closeups called for, the scene had to be rendered in precise detail. 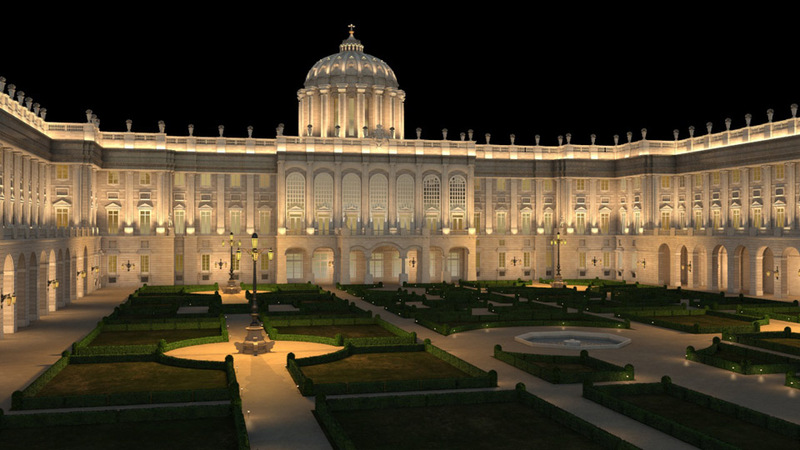 The entire palace was rendered, front and back, using reference images of multiple real palaces provided by Floyd County. Trinity also rendered multiple explosion passes, as there were many holes created in the walls of the palace. Action shot from The Grand Prix. The ramp that Benoit rode to a fiery end, from two angles. 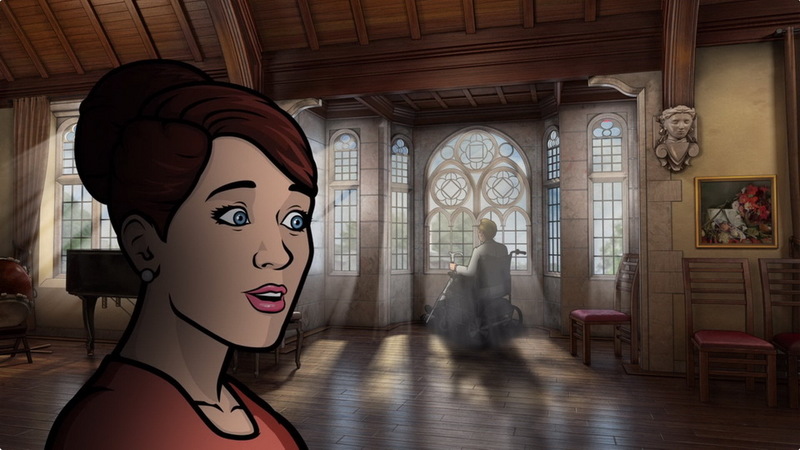 And finally we have arrived at the final entry on our list, and the largest of the animation environments that Trinity has produced for Archer to date. When the Archer team heads to Monaco to pay ransom on a sensitive item for Malory, they find themselves embroiled in a complex plot to dupe the ISIS team out of their 401k accounts. 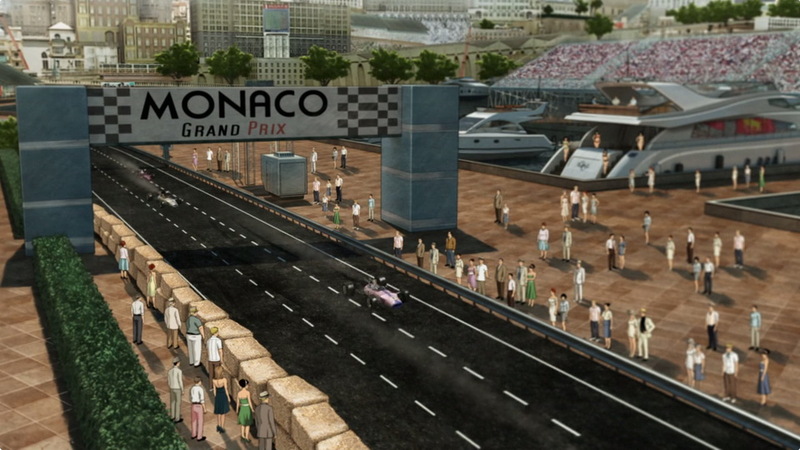 The episode reaches its climax when Archer, Lana and Ray each steal a F1 race car and completely disrupt the Grand Prix. Their aim is to apprehend a devious Benoit and recover their satchel of money, which they accomplished right before Benoit met a fiery end at the hands of his escape helicopter. Chad said that Monaco was the largest and most complicated set piece that Trinity has created. The set was rendered in two separate pieces: the race course, and the mountain road. The course itself was straightforward, but the mountain road had to be built from scratch, using aerial photos taken over Monaco. A full mile was rendered, and over 40,000 shrubs and small trees were placed to cover the cliff face. 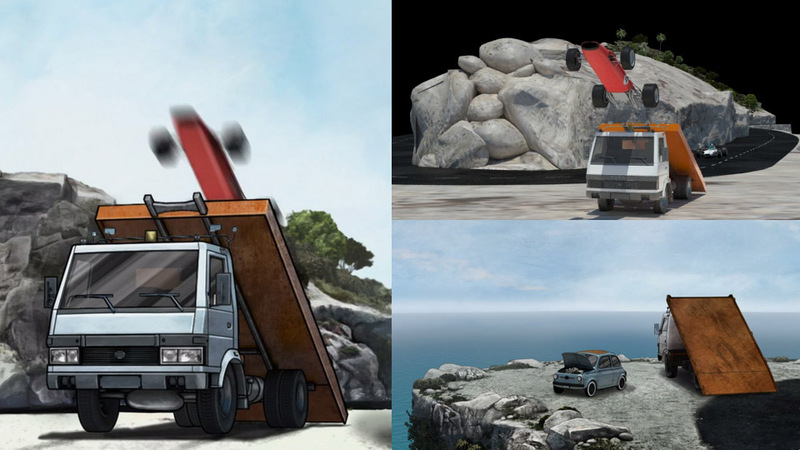 The cliffside road needed to be animated into a loop, so that the action could take place with the background blurring by. In addition, the different parts of each car had to be rendered separately (each tire, mirror, steering wheel, door, etc.) so that the animation team at Floyd County could have full and complete control during the sequence. There were over 40 different camera shots set up just for the cliffside chase (Aerial, first person, closeups, dynamic cameras close to the ground, etc.). The whole scene took roughly 600 hours to deliver. Trinity has greatly enjoyed our collaboration with Floyd County on such a fantastic show. 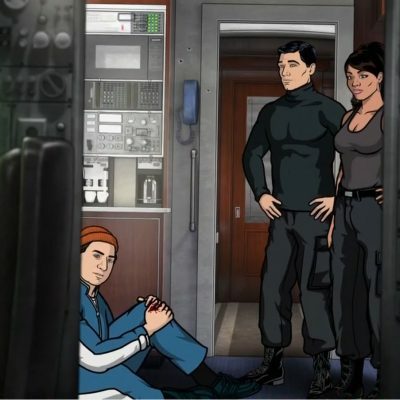 We look forward to working on many more future episodes, providing entertaining playgrounds for Archer, Lana, Cyril and the gang to practice their spycraft in. Trinity Animation Archer Cartoon Backgrounds from Trinity Animation on Vimeo.